This is one of those photo tricks that makes viewers think, ‘How did they do that?’ The answer is surprisingly simple and, like all the best Photoshop techniques, the real skill begins in-camera. To create a seemingly levitating figure we capture two versions of the scene – one with the person perched on a stable support like a bench or ladder, and the other of the empty scene. Both versions need to be in perfect alignment. So the actual camera technique is dead easy, we just use a tripod and take two shots – one of our subject, another without them or their perch. Then we piece it together in Photoshop, which – even for a complete Photoshop novice – is a pretty simple job. The shots we need for this effect have to be in perfect alignment, so use a fixed tripod throughout. Your tripod position is important too – get low to emphasize the gap between the subject and ground. Our subject should be perched atop a sturdy support in a floaty pose. For this project we used a foldable workbench, but a stool, stepladder or chair could work just as well. Use whatever you have available. As well as a shot of our subject we also need a shot of the empty scene, sans-subject or support. In order to look realistic, the exposure and focus point should stay consistent over both frames. Moody lighting and the night-time setting boosts atmosphere in this scenario. Along with the car headlights, we also had two Speedlites in play. One was behind and to the right, and another was positioned to the left-hand side of the setup. Clothes can make or break the effect, especially where the body meets the support. Make the clothes look as floaty as possible and not crumpled. Hide loose clothing over the edges of the support, or try using threads and clips to lift them up. After focusing on your subject, switch to manual focus on your lens to lock it in place so that the focus point doesn’t jump around between frames. But remember to refocus if your subject moves significantly or you reposition the tripod. If you didn’t shoot a frame of the empty scene it’s still possible to create the levitation effect from a single image, but only if there’s enough background detail that can be pasted over the bench. 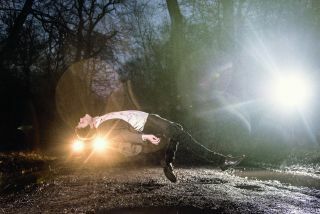 We shot our night-time scene in heavy rain, only managing to grab a few frantic poses before abandoning the shoot. But later on, we found the best pose didn’t have an accompanying empty version (we’d moved the camera between shots). The solution was to clone out the bench using Photoshop’s cloning and healing tools. Open the images (one of the subject, the other of the scene) in Photoshop. Go to the empty image, then go to the Layers panel (Window>Layers). Right-click the ‘Background’ layer and choose Duplicate Layer. In the Destination Settings choose the other image. Hit OK.
Go to the other image, you’ll now have two layers in the Layers panel. With the upper layer highlighted, hold Alt and click the rectangular Add Layer Mask icon at the bottom of the Layers panel. This will add a full black layer mask that completely hides the layer. We can now paint with white to reveal the background, hiding the bench. Grab the Brush tool from the Tools panel (or hit B). Press D to set your colour to white. Right-click and decrease the brush hardness to 0, then paint over the bench to reveal the empty scene. Zoom in and continue perfecting your layer mask. If you reveal too much of the empty scene, simply hit X to switch to black and paint to hide it again. Use the ] and [ keys to resize your brush tip as you paint, and shift-click between two points to paint a straight line. Click the New Layer icon in the Layers panel. Grab the Clone tool from the Tools panel, set it to Sample All Layers. Zoom in to where the clothes meet the bench. Alt-click to sample clothes and clone out messy areas, hiding the join and adding extra detail as necessary. Ctrl+Shift+Alt+E to merge a layer, then go to Filter> Camera Raw Filter. Use the Basic tonal controls to add contrast, tweak colours and boost clarity. Hit OK.
Floaty clothes and coats can help to emphasise the sense of weightlessness and movement, especially if you arrange them properly before shooting. Translucent material, like the dress in Tip 3, can look great if you backlight it with window light or other lights from behind. Look for scenes that include reflections, as these can help to ground the subject, helping get around the ‘cut and paste’ look you sometimes see with levitation photos. Alternatively, have them gently touch the floor or rest a foot on the wall – a point of contact like this has a similar effect. Why stop at a levitating person, why not make other objects in the scene appear to float as well, like the lamp here? Simply hold them in the air then clone out your hands later on. Or if you’re good at catching, toss them up and take a quick snap while they’re airborne.